22. SHOW ME THE STARTUPS! Startups are good. Startups mean innovation. Startups are the reason high-tech and biotech are the future. Startups are the core of the American competitive advantage. An abundance of startups is a sign of a healthy, evolving, competitive industry. A lack of startups is a sign of conceptual inbreeding of the same ideas over and over and over by a few reigning giants. So where are the startups of Hollywood? Show me the Startups! The above chart shows the number of feature releases by distributor. At first, it looks amazing – look at all those movies distributed by companies that are not the big guys! Oh snap. That doesn’t look as good. 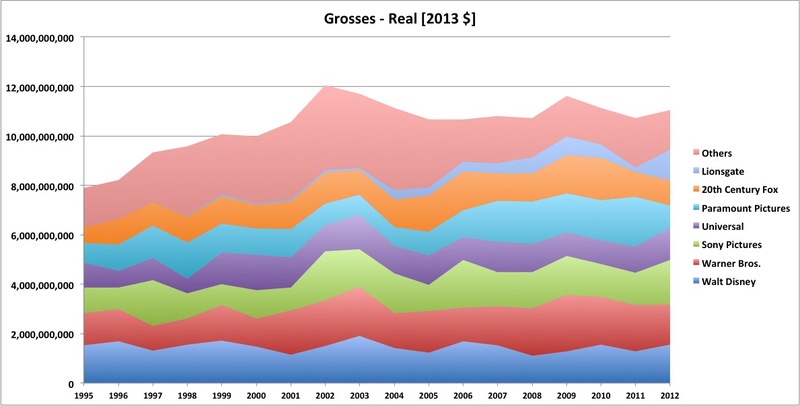 In fact, it seems that while everyone is weeping about overall box-office stagnation, the big guys are actually growing. It’s the little guys that are having their share of the pie significantly eroded. Same picture. 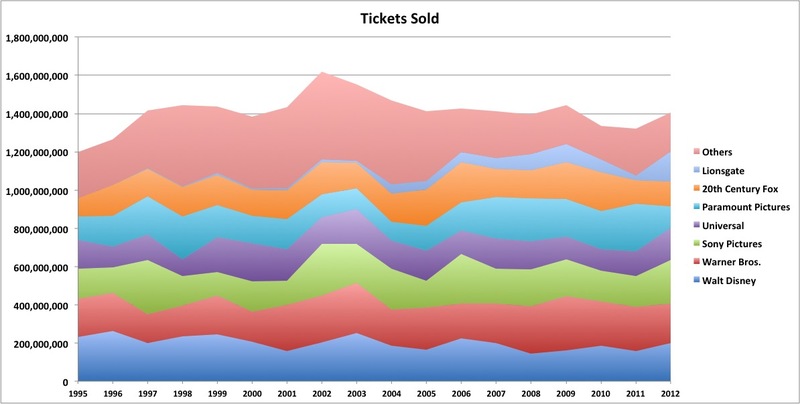 The leakage in total ticket sales is coming only from the “others” compartment – not from the big players. Again, we see that since 2004 the little guys’ market share had evaporated from 29.7% to 12.2%. The big distributors are eating into their share. It means that we are seeing more and more movies being released by new players that are not part of the “Big-7” (I include Lionsgate in that group – see why here), but these players are fighting among themselves for a shrinking piece of the pie. It means that indies are hurting. It means that this industry needs shock treatment or it will consolidate into a predictable formulaic machine. Dear studios, Indies were once your dogs – the ones who ran ahead and brought you innovation in their jaws. But now during this winter, you feast on their own flesh, feeling good about your own growth – but what will you do after you’ve eaten up all your dogs? I realize that big studios own the big distributors and that even bigger conglomerates own the big studios. I realize that cinema is evolving into nothing more than a promotion tool for home entertainment, merchandize, and amusement parks. I realize there is a bigger picture. But the even bigger picture is that at the core of all this is creativity and innovation – new heroes, new genres, new formats. It’s great that over 650 movies were released last year, but if the vast majority of them were screened in a couple of hidden locations in Tribeca, what’s the point? Innovation rarely comes from fat and happy incumbents, which is what we have here. ** Raw nominal data source is from The-Numbers.com. The data there is very similar to the data on boxofficemojo.com, but runs further back to 1995. Thanks for continuing to keep this blog, I really enjoy it! What sources did you use for the charts in this entry? The two are a bit different, but similar enough. I used The-Numbers.com for the raw nominal data for this post, just because it goes further back to 1995. Thanks for including the sources! I am working on a project related to film industry and have found your work very insightful and fascinating. Thanks for all your work on this!